A few weeks ago on facebook I noticed a friend's status. She was asking for help. Her daughter was recently diagnosed with alopecia and was losing hair. As a teen the situation was quite devastating. This reminded me of an experience I had a couple years ago speaking to another friend. She had breast cancer at the time and was going through chemotherapy. As a result she had lost all of her hair and was trying to adjust to wearing a wig. After having my two boys I lost all of my hair and am completely bald. Here are 8 reasons why I love having no hair. Why hasn't this come up before? To anyone who knows me personally, this is no secret. I'm very open about it. I usually wear a wig or fun bandana when I'm out and about, but at home I don't usually wear anything on my head. Growing up I didn't ever wear anything on my head except for hats when outside in the sun or in the middle of the winter. It wasn't until I turned twenty-one and wanted to serve a mission for my church that I chose to wear a wig. My reason was that I didn't want anyone to feel uncomfortable or have my baldness be a distraction from sharing the message I was trying to get across. In hindsight this sounds silly, but it made sense at the time. When all was said and done I didn't go on a mission, but was so used to wearing a wig by that point that I just kept doing it. My eleven year old son is at a point where he's decided that I look "cooler" in a bandana than a wig at times. He's all about the "This Is Me!" mentality which I LOVE. I think it helps that one of his favorite characters in the Black Panther movies is a bald woman. My six year old daughter is constantly telling me how beautiful I am, and that she loves her bald Mommy. She also LOVES my growing collection of bandanas and can't wait to see which one I choose to compliment my outfits. Sunshine is definitely the girlie girl of the family. My almost nine year old is so scared to show others who she really is, for fear that they won't accept her. I find myself being bolder just to show her it's okay to be real. There's no reason to hide who you truly are. Everyone has something. My almost ten year old just plain doesn't care. And my husband... I told him on our first date. He didn't care then. Now years later he realizes there are so many perks to having a wife with no hair and wouldn't want things any other way. 1. Hair is hot! Do you know how much cooler I am because I have no hair? It feels fabulous! 2. I win for taking the fastest showers in the house because I don't have to worry about washing my hair. 3. I never have to shave my legs! No hair on my head means no hair on my legs. Oh do I love this. 4. When it comes to getting ready to go anywhere, I can get ready faster than my husband. Whether I'm wearing a wig that takes less than a minute to put on and brush through, or I put on a bandana, I'm always on time. 5. There is so much money to be saved when you have no hair. Think about it! No shampoo, conditioner, styling products, curling irons, straighteners, etc. That doesn't even count hair cuts, brushes, combs, etc. 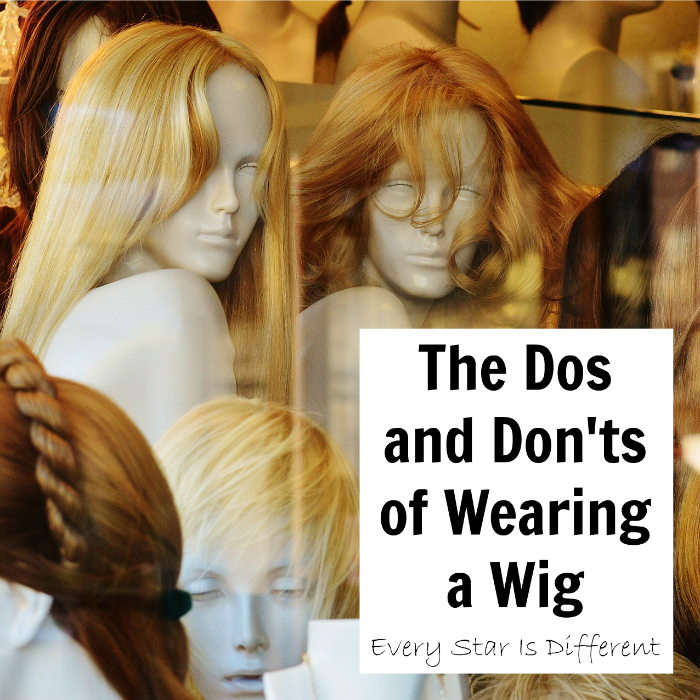 Sure wigs can be expensive depending on which ones you choose, but if you wear them only on rare occasions they can last a long time. Even if you like to have several wigs and switch them out, their cost can still be cheaper than everything else mentioned above. 6. I don't shed! Think about it. How much hair ends up going down the drain, found on your clothing, stuck in your hair brush, or on the furniture. Bald people never clog up shower drains. 7. I can change my hair color, hair length, and hair style in a moment's notice swapping one wig for another, without spending hours, months, days, or years waiting for my own hair to cooperate. 8. I never have to worry about having my eyebrows waxed or tweezed. Hallelujah! No hair on my head means no eyebrows. When I do want eyebrows, I can just draw them on in any color to match whichever wig I want to wear. Clearly, life is good without hair. So let's talk about this! As I've said again and again, everyone has something. There are so many women and girls out there who have no hair for one reason or another yet it's this taboo subject. Society likes to make us think that women without hair aren't beautiful. There must be something wrong with us. Why are bald heads, wigs, bandanas, caps, and more viewed in a negative light? What are we teaching our children when we hide who we are, especially when there are so many benefits to the real us? Hair or no hair, every woman is beautiful and worth celebrating. "Why would anyone want hair when they can have so much fun without it?" Love this! I have very thin hair and often feel embarrassed by it. I love how you OWN it, and am going to try to do the same! !